Summer is coming back again and the blue water enthusiasts are making plans for their summer holidays on board of a motoryacht to prop the waters with powerful engines or cruise the blue waters with a modern luxurious Gulet . 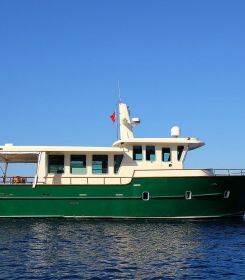 Either a small gulet for private use or a powerfull motor yacht for sale, whichever is your desire, we can respond promptly and show you the most suitable yachts for sale to satisfy your expectations. The yachts for sale industry is using space age technology and high tech materials for hull construction, interior furnitures, electric, electronics, hydraulics and performance sailing gears. You might want to stay with classic design and use natural fiber Yacht building timbers such as African mahogany, acaju, Teak to keep the warmth and elegance of wooden yachts or maintanence free grp plastic boats as alternative as well as marine grade aluminium or high tensile steel hull yachts to own a limitless, circumnavigable sailing yachts. We have been proudly serving the yachting industry for the last 30 years, providing an independent, professional brokerage service. There are numerous Turkish built Gulets for sale , Motor sailers for sale , Motor yachts for sale, Power yachts for sale and performance Sailing yachts for sale in Turkey. All the yachts either commercial or private in our Portfolio are offered for sale by their head owners. Please donot hesitate to contact us if one of the Yacht for sale matches your expectations and budget limit. We sincerely recommend first time buyers to get a professional help from an experienced captain either be a new or used yacht for sale in turkey. How many guests or family members would you like to accomodate onboard ? should it be a motor yacht, gulet or sailing yachts for sale? How long time you would spend on board ? Would you care for only coastal navigation or want to explore the oceans ? finally, How much would you like to spend ? if you are looking for a used yacht for sale thence even more important to have an expert checking your potential dream yachts for Sale or lets call her daddy’s toy. From the anchor chains to Engines and all the extra apparatus which might have on board, plus ropes, bollards, windlasses, fenders, electrical wiring, electric motors, pumps, control panels etc. everything counts…! The next step is to calculate how much is her annual maintanence expenses, fuels, mooring fees and crew wages you might be undertaking in order to know what you are really getting yourselves into. Not to forget the resale value of your dream yacht sale that should be maintained as high as possible. This means that in case you do not find your eye catching design, you can always call us via phone or contact by e-mail to tell us about what exactly you might be looking for and we will definitely locate the most suitable yacht for sale for you amongst available yachts. We offer luxury gulets built with epoxy laminated mahogany wood, motor yachts and sailing yachts built out of high tensile steel and/or marine grade aluminum alloys. we are one of the most prominent yacht brokerage company in Turkey with large numbers of inquiries about chartering and selling Turkish gulets, motor sailing yachts, and motor yacht for sale which are offered in our website. we have hundreds of successful sales in different parts of the world such as Greece, Italy, Croatia, Spain, Thailand, Dubai, Saudi Arabia, France, Maldives, Seychelles, the United States and many other countries yacht for sale which are suitable for private or commercial use. Turkish gulets have spacious interiors and are very stable with their long and heavy keel also using advanced technologies to compete with luxury motor yachts. not to mention Turkish gulets are considerable cheaper when compared with modern day motor sailers and motoryachts. luxury amenities are commonly used in this new generation gulets, yacht for sale.